The International Joint Commission "prevents and resolves disputes between the United States of America and Canada under the 1909 Boundary Waters Treaty and pursues the common good of both countries as an independent and objective advisor to the two governments. In particular, the Commission rules upon applications for approval of projects affecting boundary or transboundary waters and may regulate the operation of these projects; it assists the two countries in the protection of the transboundary environment, including the implementation of the Great Lakes Water Quality Agreement and the improvement of transboundary air quality; and it alerts the governments to emerging issues along the boundary that may give rise to bilateral disputes." "The logo (…) is the new official symbol for the IJC. The Canadian maple leaf flag and U.S. stars and stripes represent the two countries. Five wavy bars symbolize waterways and allude to the number of Great Lakes. The wreath highlights Canada and the United States working together to monitor the transboundary environment. The scroll and quills illustrate the signing of the 1909 Boundary Water Treaty." "IJC Seal and Associated Devices agreed to use the new IJC seal and preparation of associated devices and confirmed that the new seal would replace the existing IJC logo; approved design for IJC flag and directed staff to prepare plan for phase-out of existing logo". These were points g. and h. of point 15 "Other Business" in the Minutes of the IJC executive session in Washington, 7 and 9 April 2003. The old logo apparently was a map-like image showing the Great Lakes. Was this also put on a flag? The IJC is an independent, executive branch agency. 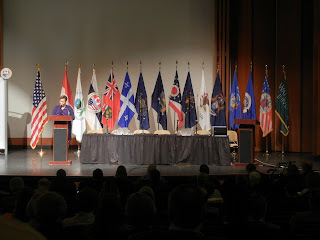 Flag: http://2.bp.blogspot.com/-VZR7uQkzKk4/TpbJxpmzHjI/AAAAAAAAA6M/2aC1qasRYf8/s320/LisaJacksonIJCMeeting.jpg (4th from left, between EPA and Ontario flags). Appears to be three horizontal stripes of white/blue/white, gold fringe and seal in center.